Excellent for window signage in high or low visibility, this polyester static cling film is designed to adhere on the printed side, so the label can be applied to a window and the print will visible from the outside. 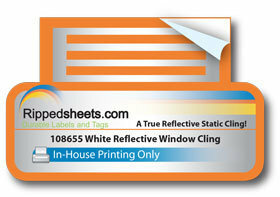 The label is a static cling, designed to be temporarily applied and reapplied as needed to glass. A retro-reflective backing allows the print to be seen clearly from outside, and is highly visible even at night with limited light sources. Excellent for parking passes. This material is available only for pre-printed, pre-diecut applications. Price includes die cutting sheets up to 30 cuts (see Plus Charges for additional cuts) with any shape or size.